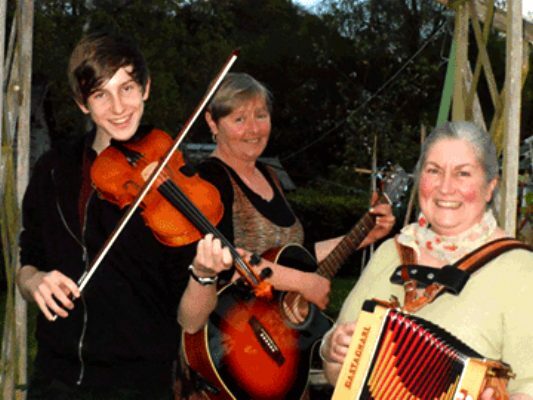 Black Cat Band loves playing for lively English Ceilidh, more sedate English Barn Dances, traditional Scottish Ceilidh and 'yee-hah' American style Hoe Downs and we choose suitable tunes for each style from our vast repertoire. Chester, but will travel within a 50 mile radius. Usual line-up is melodeon, fiddle, guitar and drums. We have our own caller, but often work with other callers. Slip jigs likes 'Drops of Brandy' are great for Strip the Willow dances and we like to play lively reels such as 'Gussie' and 'Maggie in the Wood' for the 'thread the needle' dance 'Witches Reel'. Some of our favourite tunes are hornpipes, for example 'Pretty Maggie Morrisey' and 'Proudlock's Hornpipe' which we use for step-hop dances. We do love letting rip on a good 48-bar jig - 'Blarney Pilgrim', 'Morgan Rattler' or 'Random', for example, but also enjoy going all lyrical with the beautiful Welsh tune 'Farewell Marian' which has a dreamy dance all of its own.